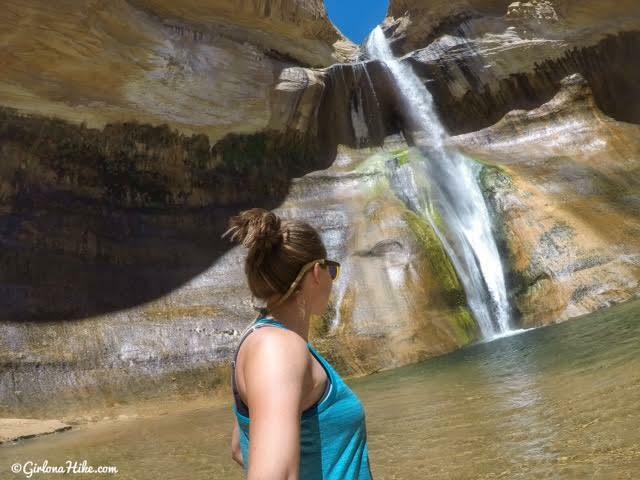 Lower Calf Creek Falls is one of the most popular trails near Escalante, UT and in Grand Staircase-Escalante National Monument. 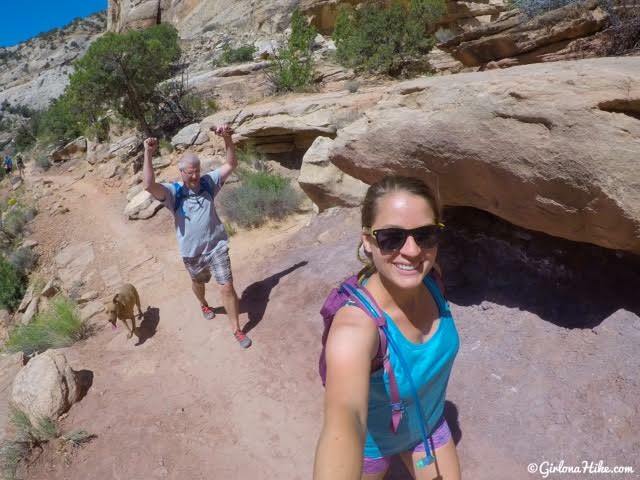 This easy 3 mile hike leads to a beautiful oasis with a 214 ft waterfall. 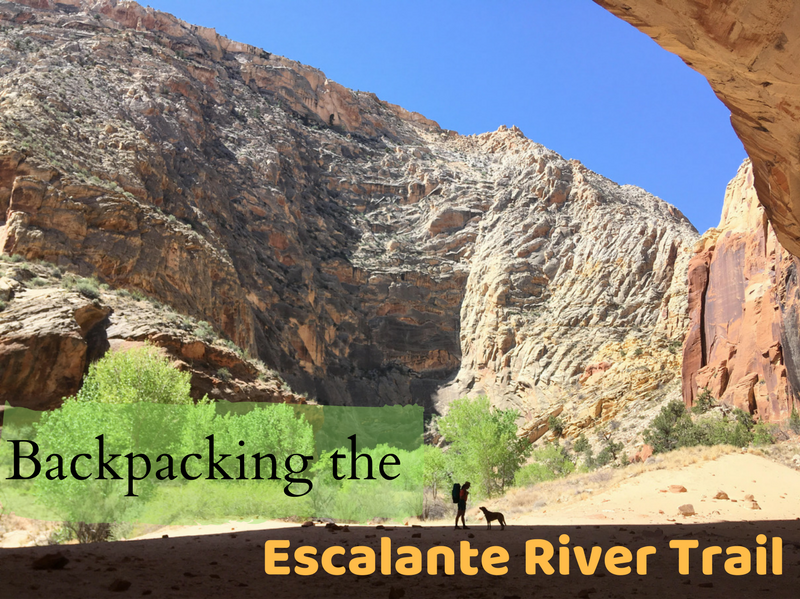 Because this hike is so easy and low in elevation, it's a great family hike for visitors with older folks, kids, and even the dogs! 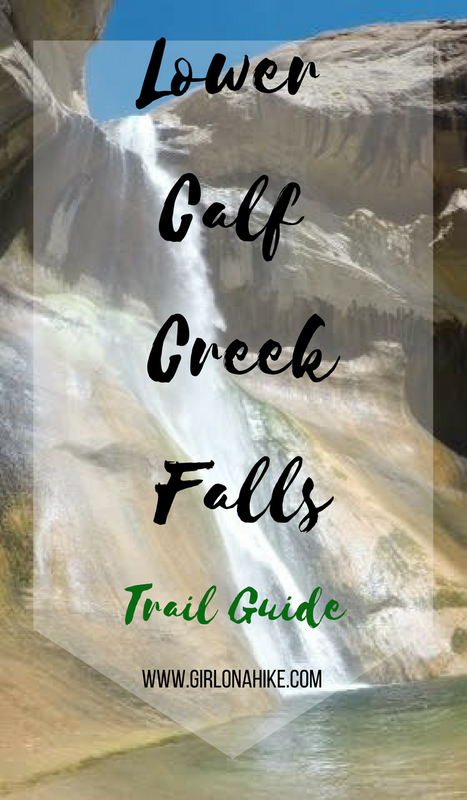 All of the green trees and creek will make you forget your are in the desert, and as you approach the waterfalls the mist will cool you off. Feeling adventurous? Bring your swimsuit and swim in the pool of clear water at the base of the falls. 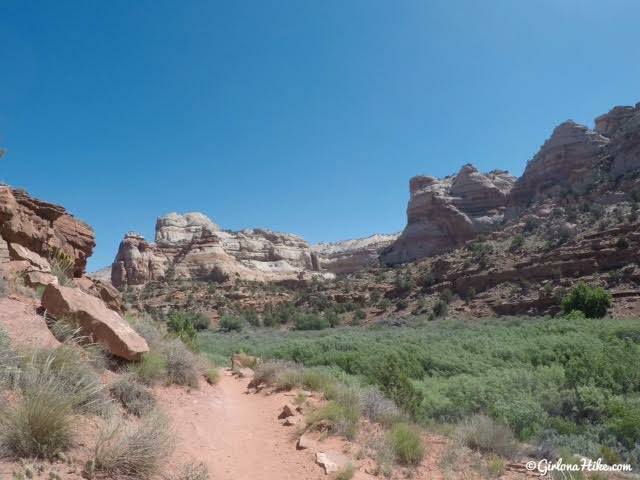 You'll want to start hiking early to beat the heat and the crowds. From Escalante, UT follow this map. If you are coming from the north such as Boulder, UT, use this map. Fees/Permits? 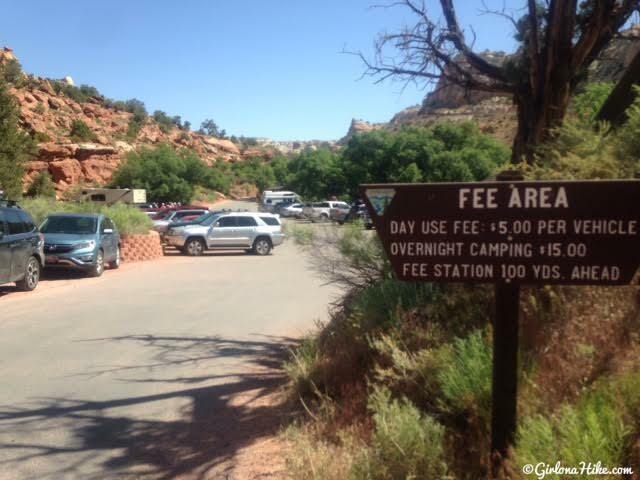 There is no permit but there is a day use fee which is $5/car. If you have the annual national park pass it's free. 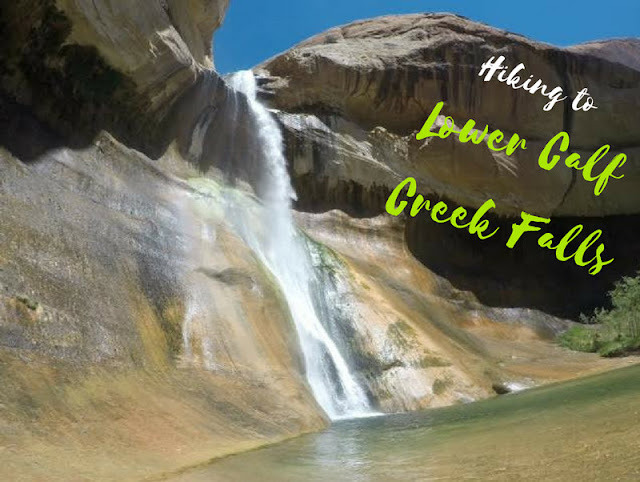 You can also camp at Lower Calf Creek Falls, but a reservation is required months in advance. Click here to make a reservation. The large sign off HWY 12 marks the turnoff for the trail. On a Friday morning the parking lot was completely full by 10am. We had to park across the bridge, then walk over. Even if you park across the bridge or along the road, you still have to pay the fee. The campground hosts were checking people as they walked in. The trail actually starts near Campsite #3, on the left side of the road. 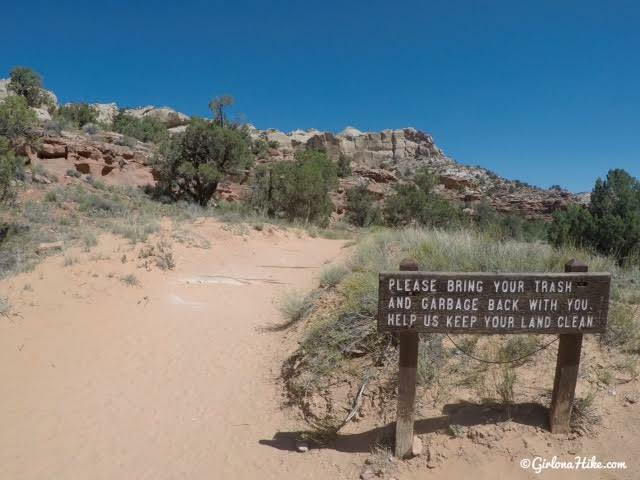 It amazes me that there needs to be a sign telling people to carry out their own trash. It should be assumed that you need to pack out what you bring in. 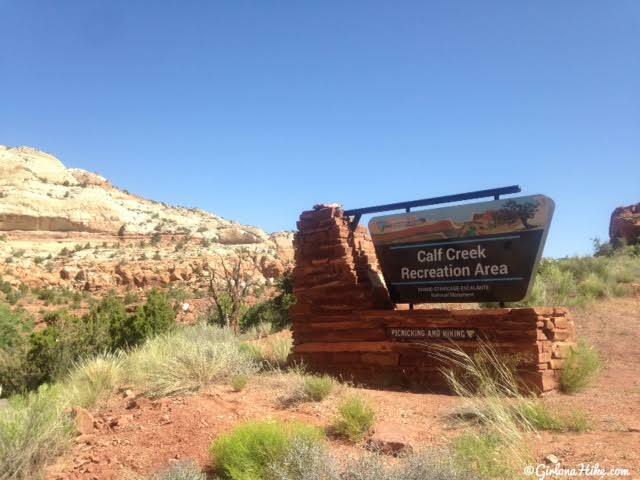 The trail is well defined as you curve around the canyon. 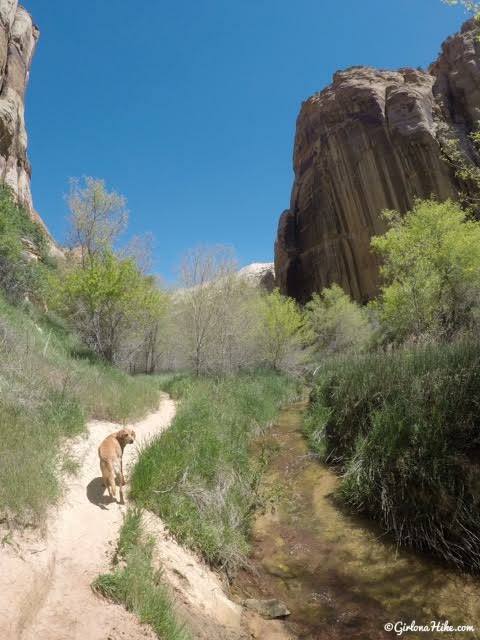 The trail is always sandy, so if you bring your dogs you'll want to start hiking early so they don't burn their paws. Eventually you'll reach this large, green meadow. 11am and already soaking in sweat! 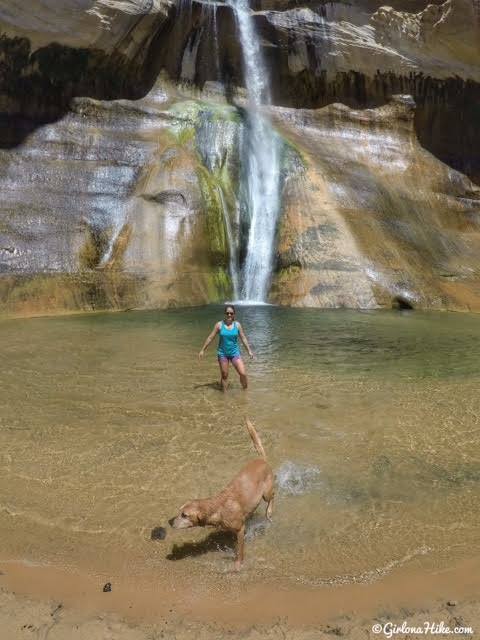 Every time we hiked close to the creek we'd let the dogs stop and drink and cool off their paws. I even got in up to my knees! Ahh so nice to be back at Lower Calf Creek Falls! The first time I visited was Memorial Day weekend in 2015. 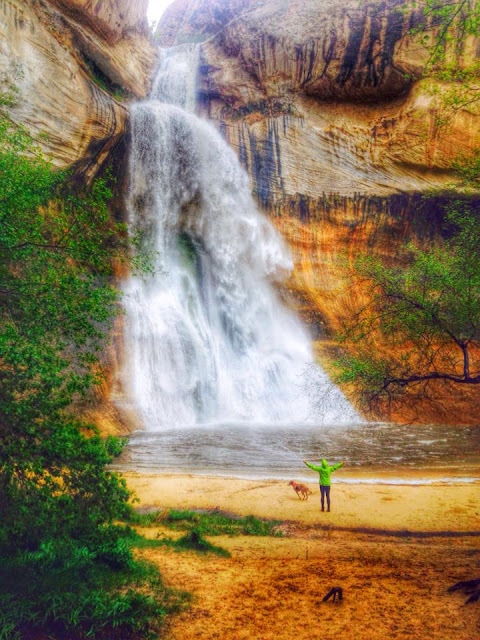 We hiked here during a big rainstorm, and the it made the falls look insane! The winds were like a hurricane, it was so bad. Charlie was so happy to run around and swim! Just a little FYI - behind me there were probably 60-70 people hanging out under the trees. You won't have this place to yourself unless you hike here during the week or a non-holiday weekend. 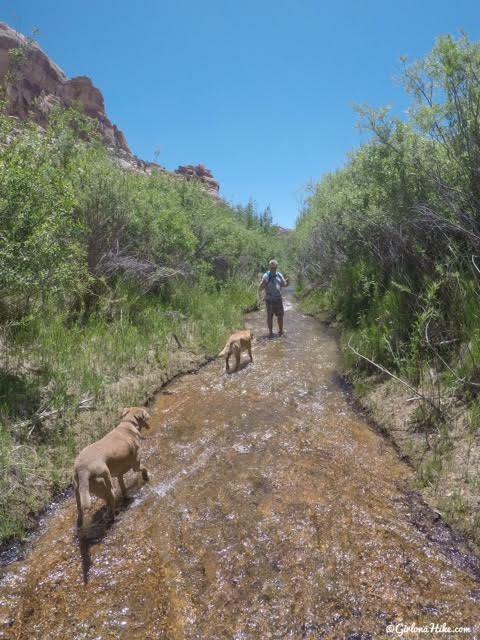 On the way back the dogs started to burn their paws from the hot sand so we partially walked back along the creek. This is a fun hike. Make sure you get a brochure for the trail. There is a beautiful perfect granary up in the cliff and three super pictographs. 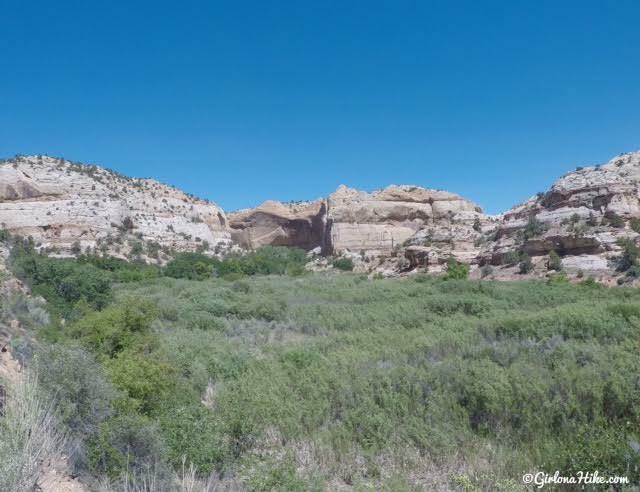 Have you ever eaten Hell's Backbone Grill not too far from this hike? An amazing place!! 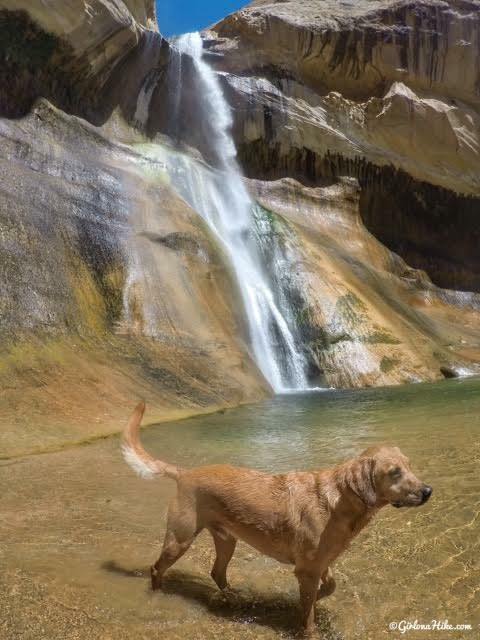 It's amazing that you even got some pictures of just you and Charlie and no others in the background with the falls on a holiday weekend. I've been there at times with big crowds and other times when there were few others around. Another favorite spot of mine there is up to the east of the falls where you can get a great picture looking at the falls from the side. Pretty awesome! From your description it seems like walking in the creek is optional- meaning the trail is not in the creek. How do you think this is in the winter? Thanks!